You can find some local events in other newspapers-- but regular Google search will not consistently find things in their scanned newspaper collection. There are several newspapers whose coverage included the Town of Warwick. The two major weekly papers that covered news primarily of the Warwick Valley area (west of Mt. Peter) are The Warwick Advertiser (est. 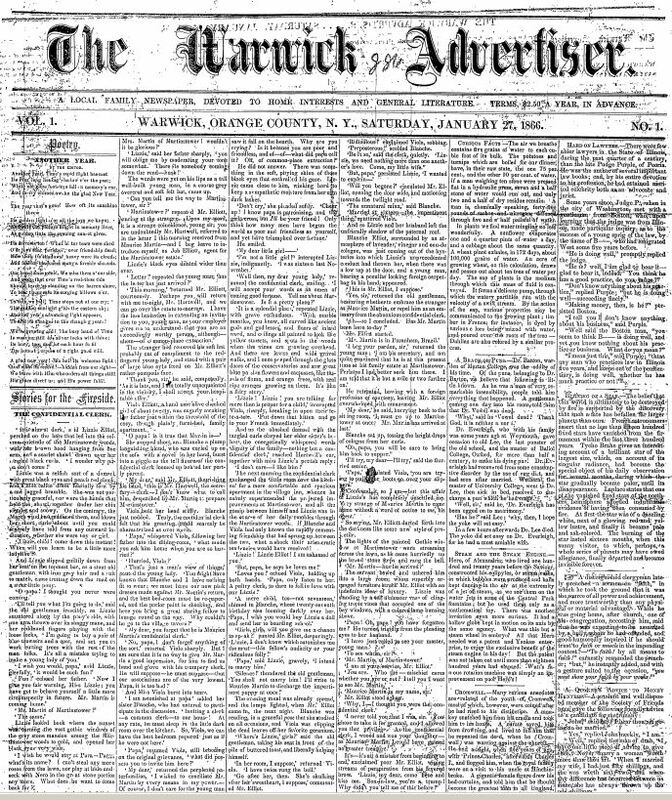 1866) and the Warwick Valley Dispatch (est. 1885). Prior to 1866, local news was published in the newspapers of Goshen, NY, and Middletown, NY. Both the Advertiser and the Dispatch are preserved in microfilm form at the local history room of Albert Wisner Public Library, and these films are gradually being digitized. The Greenwood Lake area was covered primarily by The Buzzer and the Greenwood Lake News, much of which have been digitized by the Greenwood Lake Public Library. The Warwick Historical Society Archive has a number of local newspapers in hardcopy, including some titles not microfilmed. Check their title list. Our digital newspaper contains issues from the Warwick Advertiser and Warwick Valley Dispatch. New years are being added annually. After doing a search, remember to click the "clear search" button to do a new search-- or your results will be limited to only those pages found in your first search! PDF files covering June 2004-March 2006. The Greenwood Lake News, The Buzzer, and other titles. Selected issues of the newspaper edited by Lydia Sayer Hasbrouck, who grew up in Bellvale and became a women's dress reformer. A few issues from 1856-1860, from hardcopy owned by the Warwick Historical Society. Some early Newburgh newspapers in on this site have articles about Warwick residents. Microfilm of the Warwick Advertiser and the Warwick Valley Dispatch, covering nearly all known issues, is available for viewing at the Albert Wisner Public Library in the Wisner Room. Interlibrary loan of microfilm is available through the New York State Library. Hardcopy of some years for both the Warwick Valley Dispatch and the Warwick Advertiser is owned by the Historical Society of the Town of Warwick. Before local newspapers existed, there are some very early articles that appeared in regional newspapers. Selected articles from the Goshen and New York papers are available on our Really Old News page.